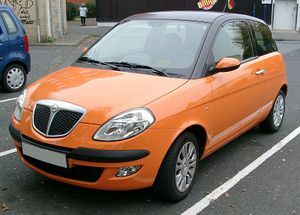 The Ypsilon is a luxury supermini car produced from 2003, evoluted in 2007 and is Lancia's best selling model as of 2006. Available with small (1.2- and 1.4-litre) petrol and JTD diesel engines, is also signed by MOMO design in one version: The Ypsilon Sport Momo Design. Main article Lancia Musa A small MPV produced since 2004, the Musa is largely based on the Fiat Idea and available with rich image and equipments as high quality. 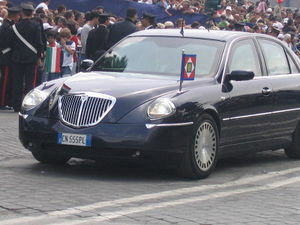 Main article Lancia Thesis The Thesis is a four-door executive sedan produced since 2002. It is the successor of the Lancia Kappa. 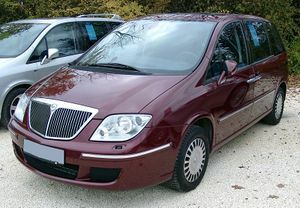 Main article Lancia Phedra The Phedra is a prestigious MPV made by Sevel, a joint-venture of PSA and Fiat Group. It is manufactured at the Sevel Nord factory near Valenciennes in France, and has been in production since 2002. In the late 1970s and 1980s, Lancia suffered an increasing image problem in the United Kingdom, centred around a perception that Lancia cars were prone to rusting, due to the Lancia Beta rust scandal. Poor rust prevention techniques and inadequate water drainage channels led to the Beta gaining a reputation for being rust-prone, particularly the first series vehicles, which were built from 1972–75. The corrosion problems could be structural; for instance where the subframe carrying the engine and gearbox was bolted to the underside of the car. The box section to which the rear of the subframe was mounted could corrode badly causing the subframe to become loose. The problem affected mostly first series saloon models and not the Coupé, HPE, Spider or Montecarlo versions. 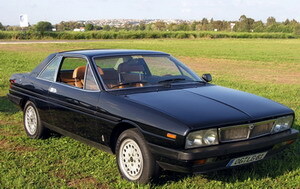 In the UK, Lancia's largest export market at the time, the company commenced a campaign to buy back vehicles affected by the subframe problem. Some of these vehicles were 6 years old or older. Customers were invited to present their cars to a Lancia dealer for an inspection. If their vehicle was affected by the subframe problem, the customer was offered a part exchange deal to buy another Lancia or Fiat car. The cars that failed the inspection were scrapped. Lancia had already introduced one year previously a six-year anti-corrosion warranty. Whilst later Betas, second series cars, had reinforced subframe mounting points and post-1979 cars were better protected from the elements, these issues, accompanied by critical press coverage, damaged the whole marque's sales success in the UK market. 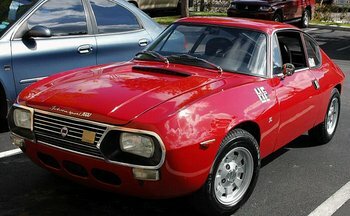 Lancia's reputation was not helped by widespread rumours of Fiat and Lancia using Russian steel. The last right-hand drive model was sold in 1994, after which Lancia withdrew from all right-hand drive markets. At this time the Thema and Dedra were the only current models. The Beta still enjoys a following today among enthusiasts. In September 2006 it was announced that the brand will return to the UK with a right-hand drive version of its new Delta, in early 2009. Whilst some models had been imported on a small scale in the 1950s and 1960s, Lancias were officially sold in the United States from 1975. Sales were comparatively slow and the range was withdrawn at the same time as Fiat in 1982. 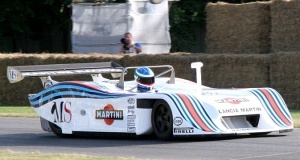 After Vincenzo Lancia's son Gianni became director of the firm, it started to take part more frequently in motorsport, eventually deciding to build a Grand Prix car. 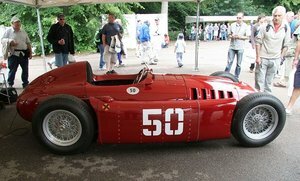 Vittorio Jano was the new designer for Lancia and his Lancia D50 was entered into the 1954 Spanish Grand Prix, where Alberto Ascari took the pole position and drove the fastest lap. In the 1955 Monaco Grand Prix Ascari crashed into the harbour after missing a chicane. One week later Ascari was killed in an accident driving a Ferrari sports car at Monza. With Ascari's death and Lancia's financial problems the company withdrew from Grand Prix racing. Lancia has been very successful in motorsport over the years, and mostly in the arena of rallying. Prior to the forming of the World Rally Championship, Lancia took the final International Championship for Manufacturers title with the Fulvia in 1972. In the WRC, they remain the most statistically successful marque (despite having withdrawn at the end of the 1993 season), winning constructors' titles with the Stratos (1974, 1975 and 1976), the 037 (1983) and the Delta (every year from 1987 to 1992). The Delta is also the most successful individual model designation ever to compete in rallying. 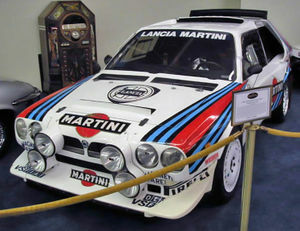 During Lancia's dominance of rallying, the company also expanded into sports cars in the late 1970s until the mid-1980s. Originally running the Stratos HF in Group 4, as well as a brief interlude with a rare Group 5 version, the car was replaced with the Monte Carlo Turbo. In 1982 the team moved up to Group 6 with the LC1 Spyder, followed by the Group C LC2 coupé which featured a Ferrari powerplant in 1983. The LC2 was a match for the standard-setting Porsche 956 in terms of raw speed, securing 13 pole positions over its lifetime, however its results were hampered by poor reliability and fuel economy and it only managed to win three European and World Endurance Championship races. The team's inability to compete against the dominant Porsche 956 and 962 sports cars led it to drop out of sportscar racing at the end of 1986 in order to concentrate on rallying, although private teams continued to enter LC2s with declining results until the early 1990s.